I often ask this question from my customers and sometimes they understand, while others are puzzled and need further explanation. I will attempt to do that here in this blog entry to clear up the difference between the two file setups and the advantages of one over the other. There are 2 disadvantages to a vinyl ready file. One is that as the vinyl shrinks it results in a bit of white space showing up between colors. The second problem is that if certain parts of the artwork change then all touching elements will have to be edited. 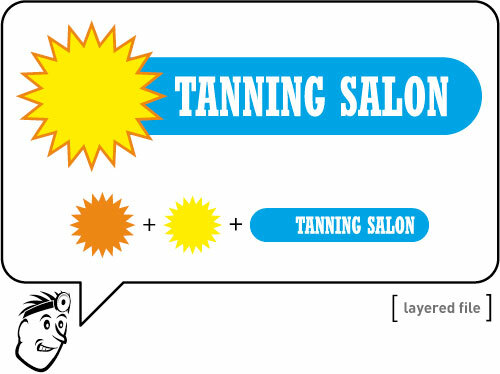 So in this case, if the sun graphic is changed, then those notches cut out of the blue will no longer line up with the new graphic. The next image shows the same file but with overlaps. I will sometimes refer to this as a print file. Notice how the various shapes all overlap one another. The advantage here is that if you want to edit or move any of the shapes, it will not affect any underlying parts of the image. The sun does not “knockout” the blue panel below. The disadvantage is if you are overlapping translucent vinyl or printing with transparent inks then it will change the appearance of the top color. You will see a ghost of the image below where the 2 colors overlap. Or in the case of solid colored vinyl, you can see an outline of the underlying shapes as bumps in the vinyl. 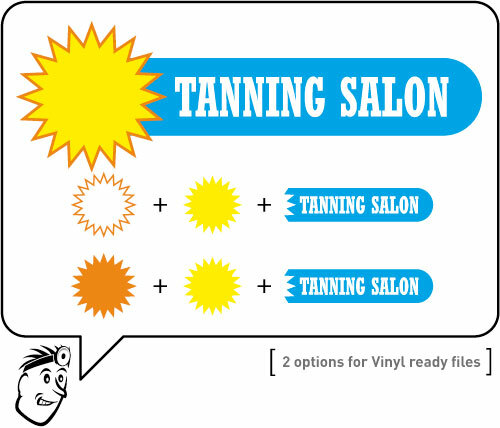 NOTE: Even if you are cutting vinyl, you may prefer the print version of the artwork because it gives you many more options to make changes or edits to the file in the future. As mentioned before, let’s assume you want to remove the sun graphic from this. All you do is simply delete and replace with the new shape. There is no reason to edit the shape below since it is independent of the others. On the vinyl ready file from image 1, you would have to go back and remove those notches and rebuild the shape. I find that the majority of my customers prefer the print ready file so that they can easily make changes to the artwork as needed. Vinyl ready disadvantages: hard to edit, does not allow for simple changes. It can result in dozens of very small shapes when dealing with very detailed images.